Figure 1 | Animation showing actual NOAA observations of global mean surface temperature superimposed on the prediction from Norman Page as shown at WUWT. The base chart is from Akasofu 2010. Figure 1a | Magnification of the forecast/observation overlap from Figure 1. There are some questions that have to be asked. Why did Norman feel he had to shift from land and sea surface temperature to the lower troposphere? When he did so, on what grounds did he split the trend line? Why did he end the split trend line at January 2015 instead of February 2016? How did he come up with the notion of a "millenial peak" in 2003? The above Figure 3 is a monthly chart, on the annual chart below it is easier to see the trend. There's not only no ice age in sight, there's no sign of a break in the trend since the 1970s. I've also marked Norman's imaginary "millenial peak" of 2003. Norman and his mischaracterised "wicked problem"
It is fashionable in establishment climate circles to present climate forecasting as a “wicked” problem. I would by contrast contend that by adopting the appropriate time scale and method for analysis it becomes entirely tractable so that commonsense working hypotheses with sufficient likely accuracy and chances of success to guide policy can be formulated. It's not climate science "forecasting" that is the wicked problem. The "wicked problem" is the policy response. "Wicked problems" are those for which the solution is bound up in the problem definition. One in which only by developing solutions to the problem can you understand the problem better. One where it's almost impossible to see all the downstream repercussions as you implement solutions. One where if you don't address the problem there will be worse repercussions. And so on. Making projections of climate is much more straightforward than deciding the best public policy solutions to climate change. If the real outcomes follow the near term forecasts in para 3.3 above I suggest that the establishment position is untenable past 2020.This is imminent in climate terms. 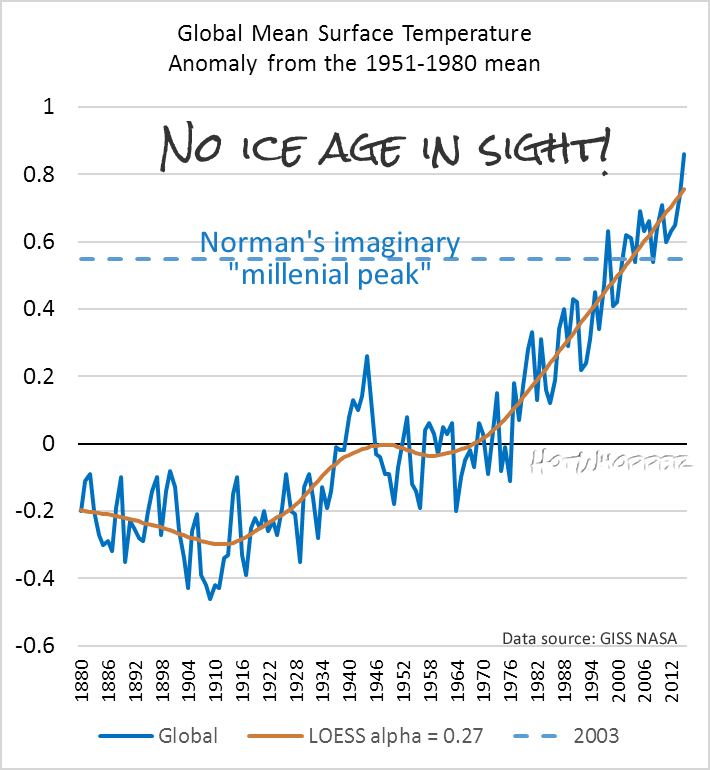 The essential point of this post is that the 2003 peak in Fig 1 marks a millennial peak which is totally ignored in all the IPCC projections. His near term forecasts seem to already be proven wrong. Also, there was no "millenial peak" in 2003 as you can see from Figure 4 above. Is it any wonder that his imaginary peak has been ignored in all the IPCC projections? The best proxy for solar activity is the neutron monitor count and 10 Be data. 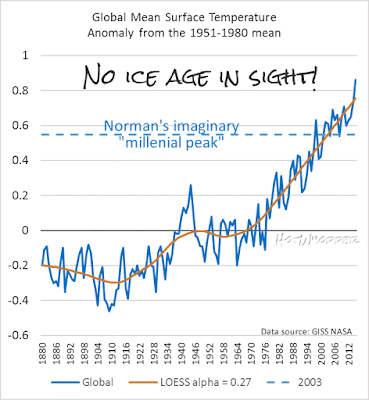 The general increase in solar activity which accounts for the temperature rise since the Little Ice Age is obvious in the ice core 10 Be flux data between about 1700 and the late twentieth century. Berggren shows that the 10Be count 400 years ago was comparable to what it is today, demolishing your 1000-year wave. Berggren’s conclusion is that the count ” do not indicate unusually high recent solar activity compared to the last 600 years”, demolishing your 1000-year wave. The Waldmeier Effect [ http://www.leif.org/research/The-Waldmeier-Effect.pdf ] shows that solar activity has not had any upward trend since 1700, demolishing your 1000-year wave. As Einstein said: “make it as simple as possible, but no simpler”. ..All you have to do is mention the Sun and lsvalgaard goes batty !!! He is an anti-Sun kind of guy !! Marcus, tone it down or I’ll be forced to put you on moderation. I would add a third egregious error that you seem too gentlemanly to mention. I would add that besides the two egregious errors you mention in the text, that the so-called scientists made the egregious error of deciding the answer ahead of time and then cooking the books to support the conclusion they started with. You might call error three “conformation bias run amok”. Frankly, there are virtually no decent comments on Norman Page's idiocy. The closest are those from Leif Svalgaard, but he doesn't make any comment about the failure of Norman's forecast to line up with what has been observed. I don't think anyone commented on Norman's rejection of the greenhouse effect. The subject of CO2 was raised by a few people - mainly to reject it. Anthony Watts must be struggling to find any decent fake sceptic. That's not a surprise - I doubt there are any. Akasofu, Syun-Ichi. "On the recovery from the Little Ice Age." Natural Science 2, no. 11 (2010): 1211. DOI: 10.4236/ns.2010.211149 (open access and worth less than what you pay for it) The publisher is on Beale's list of predatory publishers, and puts out tripe. "He hides it by writing a lot of gobbledegook about patterns and cycles that don't have any physical basis. " The key here is "physical basis". I have been researching the behavior of QBO, which is one of the most well known global oscillation patterns, yet undermined by a "gobbledegook" model proposed by Richard Lindzen over 40 years ago. And Lindzen's theory is still currently accepted as the de facto model. Dr. Norman Page is much like Lindzen in creating a Just-So story to try to explain the data. Like Rudyard Kipling observed over a century ago, the pattern in a Leopard's spots can be explained by any preposterous theory (i.e. Just-So), but that doesn't make it true. This is climate modelling with crayons: I have to wonder how he became a doctor. Or perhaps it would need Lewandowsky to explain how, being a petroleum geology doctor (from the linked Hotwhopper article), a fear of losing one's livelihood might cause an otherwise rational person to stray so far into batshitcrazyland. To judge from the date of his Ph.D. thesis (Carbonate Replacement of Detrital Quartz in Upper Cambrian Dolomites of Warren County, New Jersey, 1961), Page is another elderly crank wasting his senior years on an ill-considered hobby well outside his former area of expertise. There are more than a few examples like Page among the denier community. It's kind of sad. Perhaps he is unable to accept that his life's work has been to contribute to the destruction of the planet. See also comments at Moyhu, including Page on "expanding Earth." See also email from Freeman Dyson (sad). He is a retired Houston geologist, after all. A few points. The major difference between your interpretations and mine is of course that I am using the RSS satellite data. The sad fact is that the original standard land / sea data bases have been steadily readjusted over time by the establishment groups to try to make reality fit their computer model outcomes and they are no longer useful as a basis for climate discussion. You say "Norman is also a "world warms by magic" proponent. He hides it by writing a lot of gobbledegook about patterns and cycles that don't have any physical basis." The evidence for the millennial cycle and its timing and magnitude is strong and persuasive. I invite your readers to judge for themselves by looking at the data in Figs 1,3,4,5,and 6 in the post. 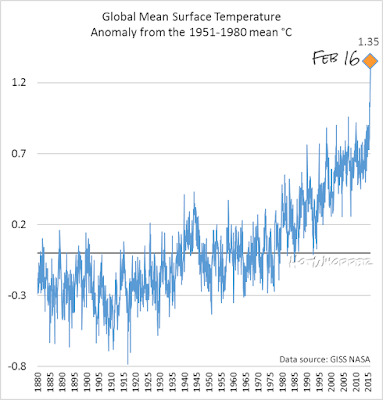 The post says " There is a varying lag between the solar activity peak and the corresponding peak in the different temperature metrics. There is a 12 year delay between the solar activity peak and the millennial cyclic temperature peak seen in the RSS data at 2003. ( Fig 5 above )"
Hence the break in the graph - and the point where the establishment make their schoolboy error by projecting upwards in a straight line. 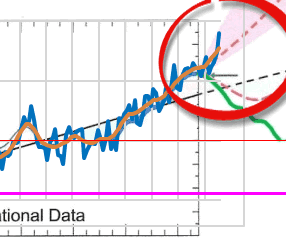 I stop the blue line at 2015 to show the cooling trend, The El Nino peak is a temporary aberration of the decadal trend which will soon dissipate as the El Nino peak dissipates. Ah yes, the worldwide conspiracy of scientists in America, Japan, and England in multiple research groups funded by multiple sources including the Koch brothers! And of course, for a denier, el Ninos only count when they are on the left side of the graph. Never on the right side. Everyone knows THAT! What about your broken forecast? That's using surface temperature, not the temperature way up above in the cold, cold air. How is it that pseudoskeptics always like to talk about steadily readjusted surface data - but somehow neglect to mention that the sum of these adjustments is to make the trend *smaller* ? Unfortunately, Pattern Recognition in Physics is gone, but Jeffrey Beall has a fine list of predatory open access journals that will publish anything for a small fee. See The peer review of Ollila (2016) for example. I mention that because Ollila was not the only signer of Will Happer's "300 scientists" (sic) letter to take advantage of such journals.